It had been over a year since the last time I went out hunting for wild mushrooms. I often think about those delicious morels. 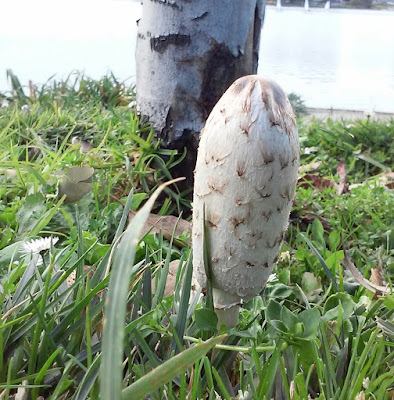 I was walking around Lake Merritt today with the pooches, and suddenly I saw a fresh full size shaggy mane sticking out of the grass. 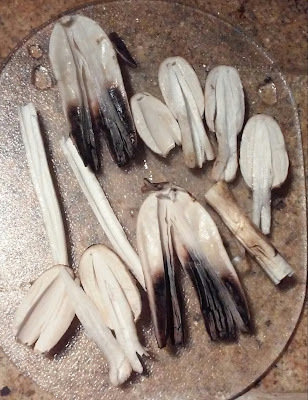 Coprinus comatus, commonly known as shaggy mane or ink cap, is one of the wild mushrooms that I am very familiar with. It is very distinctive with the scales on its cap. This mushroom is unusual because it will turn black and dissolve itself in a matter of hours after being picked or depositing spores. Another sure way to identify the mushroom is to cut it in half as the photo below. The cross section of shaggy mane has a unique kite line. It's hard to see from the photo below, but I have a better photo I took years ago in my wild mushroom photo album. I walked through the grass over to the shaggy mane and found 3 more smaller ones next to the big one. I took a photo before plucking all of them off the ground. I didn't have anything to put them in, and suddenly I remembered that I had doggy bags in my pocket. Perfect! 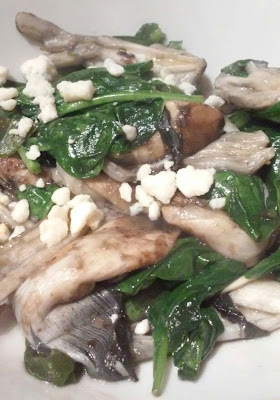 After taking them home, I sautéed them in some olive oil with some baby spinach then sprinkled some gorgonzola cheese on top. It was delicious! We are supposed to have more rain. I can't wait to find more presents like this while out walking!